Once upon a time, there was a mysterious anchorite whose spirit took possession of music after necromantic chemical evocations although his body lied seemingly motionless in the middle of the desert, but a group of "young punks pretending to be old hippies", as Dekorder defined Datashock, decided to sleuth him by sifting those desert lands and even the spiritually figurative ones that our "civilized" world constantly provides and generates. That's how a fable about the interesting direction that this leaderless collective gave to its musical research could begin. All those listeners who say that once fire becomes ash, it cannot be re-lit, could be belied as they could get a glimpse of unforgotten pioneers of psychedelic prog-rock and astral bodies of cosmic knights and krautrockers - Amon Duul, Popul Vuh, but laso some mystical stuff from Delerium Records could resurface from the depths of your musical memory - into the mystical bonfires they lighted over the eleven stages of this musical journey, even if the distinctive trait of Datashock sound is the dilution of notorious long-lasting rides so that notwithstanding the stylistical territories their wandering over "Saarvannah", a wise combination between the name of the most known desert of the planet, Savannah, and the name of the well-known German industrial district, Saar, which highlights the topicality of the association between evoked desert lands and the cultural and spiritual desertification as well as the mirages which got accelerated by moribund capitalism, they wisely dissolved elements into a variegated pot-pourri whose fragrances (from the more "totemic" moments like "Tod in der Saarvanne" or the opening "Mudschahidin der Liebe" to the electronic glimmering coiling or levelling of "Fanta Morgana" or "Desert Lustgerte, Goldnougat Gobi", from the improv-oriented eruptions of "Ekstase der Wahrheit" to the oxidations of above-mentioned mystical prog-rock stuff on tracks like "Rubinregen aus der spirituellen Sphaere" or "Der verschleierte Helm des Pharaooze") uniforms with the manifest final possible destinations: the mecca of magical melodies, the shrines of mind-expanding sounds, the sanctuary of musical friendship and the Dyonisian temples of love and excess so that it's not a real problem if any oasis (or dead anchorites) are in sight! 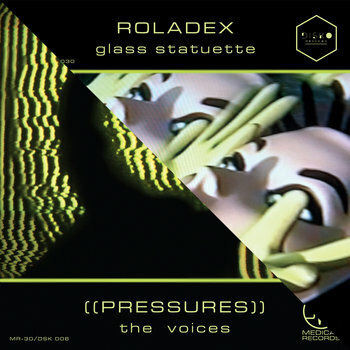 ((PRESSURES)) / Roladex: Split 7"
Produced by Medical Records and Disko Obscura Records this new 7" is a double A Side single which has on one side ((PRESSURES)) and on the other Roladex. Coming from New Orleans ((PRESSURES)) have an LP out on Disko Obscura entitled 'Casting Shadows'. Their track "The Voices" is a good tune of electronic synth wave with fast paced rhythms and vocoder filtered vocals. Simplicity is the way to go but there's a good mix of analog synth sounds that make of it a nice one. Roladex, after their first album 'Anthems For the Micro-Age', always on Medical Records, sound a bit more melancholic because of how they use the girl/boy vocals but also their track 'Glass Statuette' sound catchy thanks to pop hooks and nice arpeggios. Of this track a vhs lo-fi style video has been produced and I think it will be soon available on Youtube. The 7" is pressed on high quality transparent yellow vinyl and will be available on September. VV.AA. : Italian Resonances | Dronegazers? Title: Italian Resonances | Dronegazers? This release is a project by Fabrizio Garau, the mind behind "the New Noise" webzine, aiming to create a guide to italian drone music. However, this term is to be intended loosely, as this release, fortunately, is focused on path closer to experimental and electroacoustic paths than classic ones. The quiet soundscape of "Descending", a track by Enrico Coniglio, opens this release suddenly developing with sustained guitar notes and resonances. The next track, from Alberto Boccardi, "Far Light", starts with approximately thirty seconds of silence until a small noise enters and the track unfolds with layers of small noisy loops and, in the last parts, they fades in favour of a quiet drone. The next artists are Easychord with "Fear Of Tunnels", an almost canonical dark ambient track, and Attilio Novellino, with "Litost", with a track closer to "Descending", as it's focused on guitar lines, but quieter and with a subtler sense for nuances. Cristiano Deison, with "No One Will Listen, But You'¦", orchestrates a colourful track that uses a wider sound spectrum. "On", a Giulio Aldinucci's track, is based upon a drone juxtaposed upon a sort of field recording and ends with an almost religious organ tune. "Pilgrim", by Francesco Giannico, is perhaps the most gentle and layered track of this relase. All this artists, under the name Dronegazers collective, close this with "Anner II" an evocative dark ambient track where the resonances constructing the drone evolve until the inevitable fading. Perhaps this release is less wide than conceived but could be a good introduction to this scene and is a statement that it deserves more press coverage that it has. It's worth a listen. After being bootlegged several times in the past years, first on CDR and then on LP, the first and only album of Canadian's band Iko is about to be reissued officially by Medical Records. "83" has been released officially by the label Manhattan - Formula back in 1982 and had eight electronic tracks in balance from post punk and pop. Songs like "Communication Off" or "Jungle City" (available on this reissue for the first time) contained elements of post punk roughness (check the vocals and the noise effects) as well as a robotic approach to sounds and rhythms. Other tunes like the French sung "Gonadotropic Synthesis" or "Elevator" show synthpop influences of bands of the likes of Telex thanks to that particular melodic catchy tunes mixed to dry synth sounds and upbeat tempos. This reissue contains the aforementioned unreleased track"Jungle City" on the vinyl version and the digital version, which can be purchased separately, has four bonus tracks (these tracks can be downloaded using the coupon available in the LP): "Military Service", "Surrender To The Dream", "Army Service" (song that isn't available on the bootlegs) and a live instrumental version of "Surrender To The Dream" (which sounds more experimental compared to the studio version). "Surrender To The Dream" offer a view of how would have turned Iko's sound, because they sound a bit more wave with lushy atmospheres with slapped bass lines and few guitar inserts. 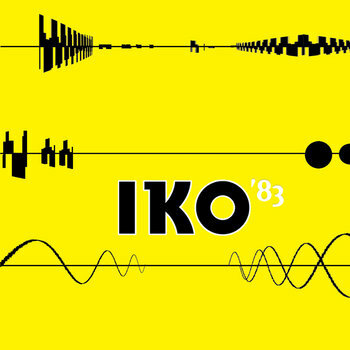 Mastered and equalised from the original master analog tapes, "83" is available on high-quality 180gram heavyweight half and half yellow and black vinyl and has also a bonus insert with interview and retrospective by Dave Segal. This reissue will be available on late September 2014. Lucky Bone is the work of experimental filmmaker Neil Gravander, who hails from Milwaukee, Wisconsin. I could find very little about this project, but he is a graduate student at University of Wisconsin, Milwaukee who has exhibited his work at various shows. The liner notes are cryptic, but for this album it doesn't really seem to matter. For example, 'Part one is pre-summer something needle with recordings from the thieving boyfriends girlfriends fathers house also BPWS live on the NYC boardwalk, n' LB is Borderline and sad, and home-alone too: spiritual.' If this doesn't seem to make much sense, remember: it probably doesn't matter either way. Sonically, this album is all over the map, but remains firmly in the constellation of heavily treated sound source. Imagine taking a radio and then cycling through the stations, recording it as you go along. Now run it all through some heavy distortion and the occasional pitch bending. This gives you a taste of what you are in for. At some points the loops can get a bit repetitive, but this album moves on from place to place, like a shark that must constantly remain in motion or it will die. For example, at 10 minutes in we are treated to processed catcalls of 'Come on, girl!' followed by a truly terrible karaoke rendition of Madonna's 'Borderline.' It was funny, but got a bit dull by the end. Later, at 25 minutes in, he seems to be introducing his project by discussing the fact that he just got back from touring which then slips into voice samples that get tweaked beyond belief. At 52 minutes in, we take a trip down the radio dial over and over again, with slight variations on the theme. At 56 minutes in, we are told that this song is 'the story of how I broke my shoulder,' which then takes feedback, hum, and what may be synth and runs with it. Overall, this is noisy experimentation that doesn't seem to take itself too seriously. This last part may be its saving grace; the humorous undertone allows us to be much more forgiving. If you like lo-fi experimentation, this is one to check out. Think of this as a cross between Hafler Trio, Bob Ostertag, and anything that has come out on Breathmint Records. This album weighs in at around 76 minutes.